Nukewatch is a Wisconsin-based environmental and peace action group, dedicated to the abolition of nuclear power, weapons and continued radioactive waste production. Nukewatch brings critical attention to the locations, movements, dangers, and the politics of nuclear weapons and dangerous wastes. Staff and volunteers advocate Gandhian nonviolence in education and action, and report on nuclear issues in the Nukewatch Quarterly newsletter. Nukewatch organized — for 13 years — two to four activities each year at the Navy’s Project ELF in northern Wisconsin in opposition to this first-strike nuclear war communication system. It closed on September 30, 2004. Nukewatch monitors the transportation of radioactive waste around the country and around the world on an on-going basis. Nukewatch, based ten miles east of Luck, Wisconsin, evolved as a project of The Progressive Foundation. Nukewatch functions as an independent action group working for peace and justice, with a primary focus on the nuclear industry. The organization’s various projects bring critical attention to the locations, movements, dangers, and the politics of nuclear weapons, nuclear power and radioactive wastes. Staff and volunteers advocate nonviolence in the spirit of the civil rights movement in education and action to abolish nuclearism. The Progressive Foundation, a 501(C)(3) non profit organization, was born in a Milwaukee, Wisconsin courtroom on the morning of March 9, 1979, when a federal judge handed down a precedent-shattering decree restraining the Progressive Magazine from publishing an article about secrecy in the U.S. nuclear weapons program. The Progressive Foundation was created by the magazine to educate the public about the issues in that historic First Amendment case. The foundation broadened its agenda after the federal government, in the fall of 1979, abandoned its attempted censorship of the Progressive magazine. Government secrecy and misinformation keep the nuclear industry alive. Nukewatch investigates the industry and lets the public know what the government refuses to divulge. An example of this type of work is the Missile Silo Mapping Project. In the mid 1980s Nukewatch organized hundreds of volunteers across the country to find and document the location of all 1,000 land-based intercontinental ballistic missiles (ICBMs). Prior to our mapping project, U.S. Citizens were never informed of the missiles’ locations, although the information was available to foreign governments through satellite surveillance and treaty agreements. Maps, post cards and the book Nuclear Heartland: A guide to the 1,000 missile silos of the United States were some of the results of this three-year project. Throughout human history, nonviolent direct action has played a constructive and formidable role in confronting and overcoming injustice, violence and war. 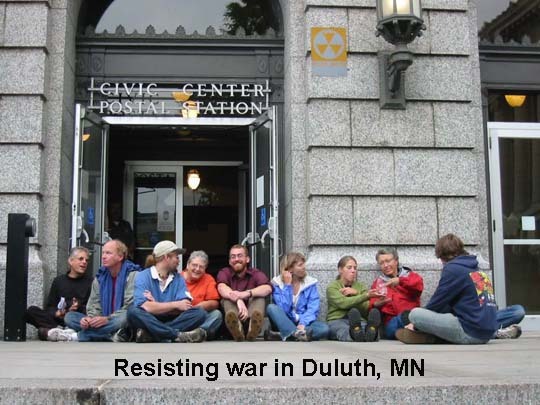 Nukewatch offers workshops and training in nonviolence and conscientious civil resistance as a way of life and as a tool for creating positive social change on a grass-roots level. We define nonviolence as the avoidance of injury to other people, whether deliberate or unintentional. This nonviolence thoroughly embraces the acceptance of personal responsibility for the consequences of our actions, legal and otherwise. This acceptance of responsibility for civil resistance has led Nukewatch activists to endure the ordeal of jail-going many times.